Tropical forests support over two-thirds of the world’s terrestrial biodiversity yet globally up to half are degraded. Increasingly, anthropogenic disturbances have resulted in environments dominated by secondary forests, agricultural mosaics and other human-modified habitats, leading to profound changes in biodiversity. Logged forests are increasingly considered an important habitat to protect, for both ecosystem stability and biodiversity preservation. However, the value of logged forests in preserving tropical biodiversity depends on the landscape scale context. Understanding how factors such as fragment configuration, fragment shape and size, and distance to continuous forest affects communities is therefore vital for landscape planning in order to maximise biodiversity. Simon’s PhD research is focused in Sabah, Malaysian Borneo, part of the oil-palm-producing region of Southeast Asia. Here, degraded forest fragments in the broader oil palm landscape are typically on steep slopes or in protected riparian reserves. Malaysian law mandates the preservation of 30m riparian buffers along all rivers and streams of greater width than 5m. Few studies have examined the role of riparian strips in preserving vertebrate diversity, and most of those in tropical regions have taken place in the Neotropics. Simon will address this knowledge gap by investigating the value of riparian strips for birds and bats. 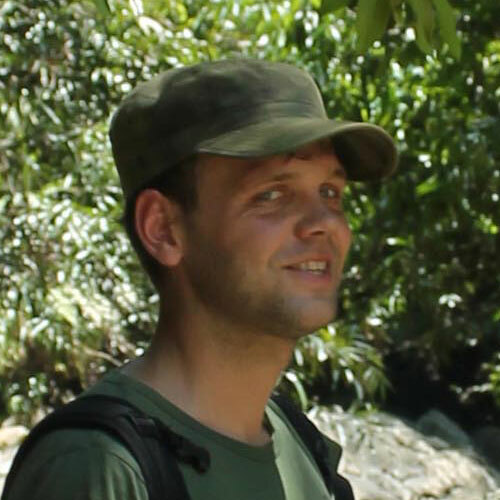 Simon’s work is based at the Stability of Altered Forest Ecosystems project (www.safeproject.net) as part of the NERC-funded research consortium LOMBOK (Land-use Options for Maintaining BiOdiversity and eKosystem functions, http://lombok.hmtf.info/). As part of the LOMBOK team and in collaboration with the Universiti Malaysia Sabah, he is sampling bird communities in forest patches and continuous habitat over multiple years using visual and audio point counts. He is also sampling bats at the same sites using acoustic monitoring. By generating occupancy models across both taxonomic groups, Simon aims to elucidate the changes in vertebrate diversity in relation to various configuration and landscape-scale questions, as well as the changes in both bird and bat communities associated with fragmentation, with particular references to riparian buffers. Simon Mitchell is a member of the Durrell Institute of Conservation and Ecology. Luke, S. et al. (2019). Riparian buffers in tropical agriculture: scientific support, effectiveness, and directions for policy. Journal of Applied Ecology [Online]. Available at: https://doi.org/10.1111/1365-2664.13280. There is a weak evidence-base supporting the effective management of riparian ecosystems within tropical agriculture. Policies to protect riparian buffers - strips of non-cultivated land alongside waterways – are vague and highly variable between countries. From a rapid evidence appraisal we find that riparian buffers are beneficial for hydrology, water quality, biodiversity, and other ecosystem functions in tropical landscapes. However, effects on connectivity, carbon storage, or emissions reduction remain understudied. Riparian functions are mediated by buffer width and habitat quality, but explicit threshold recommendations are rare. Policy implications. A one-size-fits-all width criterion, commonly applied, will be insufficient to provide all riparian functions in all circumstances. Context-specific guidelines for allocating, restoring and managing riparian buffers are necessary to minimise continued degradation of biodiversity and ecosystem functioning in tropical agriculture. Mitchell,, S. et al. (2018). Riparian reserves help protect forest bird communities in oil palm dominated landscapes. Journal of Applied Ecology [Online] 55:2744-2755. Available at: https://doi.org/10.1111/1365-2664.13233. 1. Conversion of forest to oil palm agriculture is a significant and continuing threat to tropical biodiversity. Despite this, little is known about the value of riparian reserves in oil palm and how these conservation set-asides might best be managed to maintain biodiversity. 2. We quantified bird community structure of 20 sites in an oil palm-forest mosaic in Sabah, Malaysia using 6104 detections from 867 point counts. Sites included oil palm riparian reserves of various vegetation quality and reserve widths, which were compared to oil palm streams without a riparian reserve, riparian areas in continuous logged forest and non-riparian logged forest control sites. 3. Riparian reserves, oil palm waterways, continuous riparian forest and non-riparian control forest sites supported distinct avifaunal communities. Generalised linear models showed riparian reserve width, forest quality and the amount of surrounding forest cover to be the strongest predictors of bird species richness. For forest dependent species, each of these predictors had stronger effect size when compared with all species. On average, reserves held 31% of all species and 30% of forest specialists, whereas continuous riparian forests averaged 32% of all species but 38% of forest species. 4. Riparian reserves with >40 m of natural vegetation on each bank supported similar bird diversity to riparian habitats found in continuous forest. However, to support equivalent numbers of forest-dependent species and species of conservation concern, reserves would need to be at least 100 m wide on each bank. The highest numbers of species were found in riparian forest with above-ground carbon densities exceeding 75 tC ha-1, indicating the importance of habitat quality, as well as width, in supporting riparian bird communities. 5. Synthesis and applications. If designed and protected appropriately, riparian reserves support diverse bird communities including many species of conservation concern in oil palm estates. This can be achieved by designating large reserves (80-200 m total width), but to maximize species numbers forest disturbance should also be minimised prior to conversion as well as during plantation operations. Padfield, R. et al. (2019). Co-producing a research agenda for sustainable palm oil. Frontiers [Online]. Available at: http://dx.doi.org/10.3389/ffgc.2019.00013. consuming countries of India and China.